Each customer may have one or more customer Ship To locations stored in Acctivate, which are stored in the Ship To tab of the Customer Window. Open the Customer window by selecting Customer > Customer Information on the menu bar. Open a customer, by using the Lookup button or by typing their company name in the Customer Name field and pressing tab on your keyboard. Note: If you are adding a new customer with multiple ship to addresses, click the add new customer button (refer to: How do I add new customers?) and enter all necessary information and click save to have the ability to add ship to locations. Select the Ship To tab. Click the Add button from the Customer window toolbar. In the Location field, enter a name for the location (ship to address) that will help users identify it. Click the Edit button to the right of the Address block. 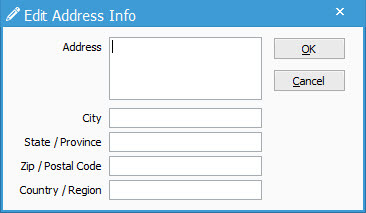 This gives you the ability to enter values into specific fields for the address. Enter information in all other necessary fields. To add more ship to locations, click the Add button and repeat steps 4 through 11 for each contact added. All the added contacts will be in the Location field drop-down list on the customer and sales order windows. To view a certain ship to address (if you have multiple locations), select the location in the Location field drop-down and the address information will populate the different fields. To remove a ship address from the Location field drop-down and from the system, select the location and click the Delete button from the Customer window toolbar.